In playing The Game, you will have to determine the attribute scores of your character. The attribute scores will be fleshed out in the coming days. For now, let us look into what the attributes mean. 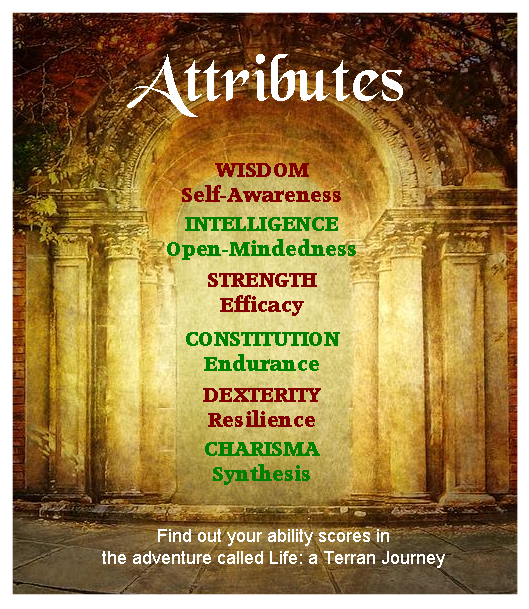 You have six attribute scores that represent your characters basic capabilities in The Game. Everything that happens to you is based on an interplay of these basic attributes. Most of your character's actions and decisions are composite reflections of all six attribute scores. Higher scores will definitely mean better opportunities and better chances for your character in completing the quests you accept. Each attribute score has an acceptable range of 3 to 18. Click on the attribute link to find your score in the sliding range of scores. Regional variations may apply. Traditionally, STR measures physical power important for dealing melee damage. In The Game, STR is a measure of your power to get results. It is a way to predict the success of any endeavor you take. A character with an STR of zero will be completely helpless, without the capacity to do anything even for the self. DEX is a measure of agility and speed, and in The Game we will refer to DEX as a representation of your character's Resilience. It measures how fast you can bounce back from setbacks. It measures your agility when dealing with drastic changes that affect your daily life. This attribute is important for characters who want to thrive during crisis situations and learn as much as they can from moments of failure. CON determines your characters health. More than that, The Game treats CON as a measure of your character's long term capabilities or endurance. This attribute adds to your ability to focus on a task for extended periods of time. It also allows you to follow through on a quest that goes beyond the expected timeline. It is also said that this is one of the more important attributes because it determines your level of patience and your capacity to wait. Definitely, to be able to forge on when times are tough you will need extra amounts of energy. CON can be developed by practicing energizing strategies like active rest, meditation and exercise. INT is describes how much your character allows or prevents knowledge into your system. Every Terran has the same capacity for accepting and retaining information. The main difference is determined by how much tolerance you have for new things, different perspectives and the humility to accept the great possibility that you might not know. The higher your INT the less barriers you place to create change. Seers, Bards and Champions will have a natural affinity to this attribute as they are continuously exposed to the chaos of reality. WIS measures how much a character knows about the self, strengths and weaknesses, patterns of thought and emotion, frameworks of judgment and perception, belief systems and decision processes. If you are aware of how and why your character thinks, feels and behaves in the way she or he does, then you have a high level of WIS.
CHA represents your character's ability to connect with concepts, ideas and other Terrans. Through connections, your character generates goodwill and trust within your spheres of influence. A person's likability is determined by CHA. This attribute also affects the way people react to your words, actions and your overall presence. 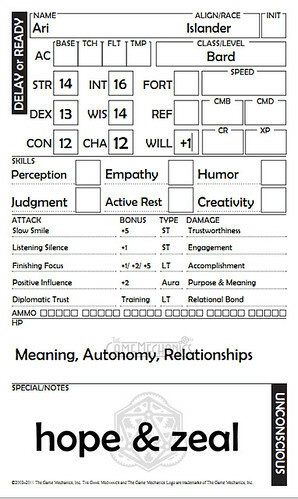 The extent of your character's auric power is determined by this attribute's score. Attribute Score Tables will be posted in the coming days. I personally like to record my attributes using the free Initiative Cards from The Game Mechanics. The graphic on the right is for my character using the End of Round version. Okay, so attributes help you with quests. Have you ever tried doing month-long quests just to see if you can do it? Try it out. Is there supposed to be a way to log our self-assessment in The Game or do we keep them in mind only for our own self tracking? Is this where it finishes? Sorry that I have neglected this initiative. I still want to continue developing this framework, but not in the foreseeable future. Thank you for your comment. Have a great day!